A couple weeks ago was Chris’s birthday. 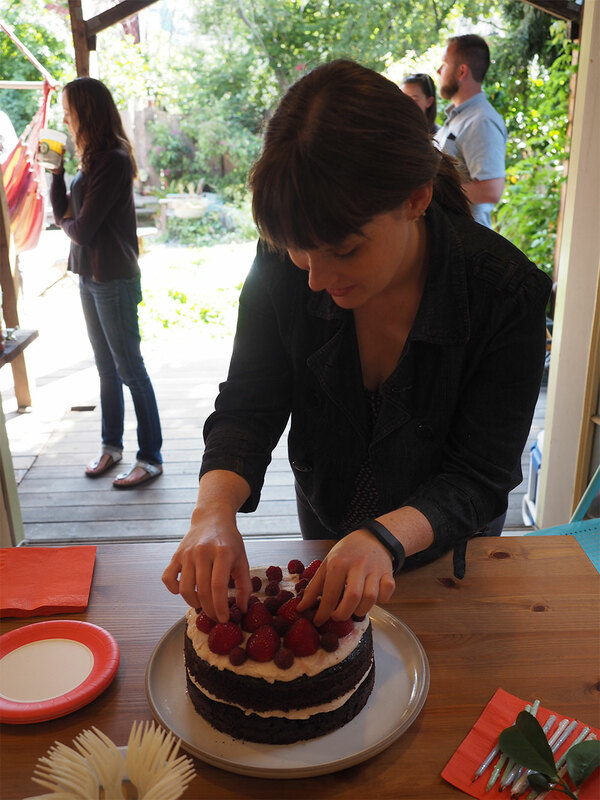 We celebrated with friends in our lovely Oakland backyard. It was a simple, casual afternoon party, just good friends and good conversation. We had a much larger party for Chris’s 30th birthday a couple years ago in this same backyard. That party had a Mario Brothers pinata, hand-made decorations and full menu of BBQ and mac and cheese. Oh and shots. Plenty of shots. Needless to say, that was a much larger affair than this year’s party. Maybe we’re just getting older but this year we wanted to keep it simple. No more stressing that food isn’t warm or is getting eaten by bees. Damn you bees! This year, we kept it simple — chips and guac, spicy nuts and kettle corn. Despite the slight compromise on the menu, one place I’m never willing to compromise for a birthday party is on the cake. It isn’t a party without a cake — or a pie I suppose if you’re a pie person. But for me at least, the party hasn't started until there’s a homemade cake on the kitchen counter. This cake got rave reviews in the form of second helpings. The cake itself was moist, and the tea-infused berry frosting was a subtle but really interesting take on using berries in cake. But I’m getting ahead of myself. Before the day of the party arrived, I need to decide what I was going to make. I knew there would need to be chocolate. And I knew there would need to be berries. I found a great chocolate cake recipe and decided to keep that part simple. The frosting is where things would get interesting. I knew from some research that you can infuse butter with tea, similar to how I infused cream with tea in my Plum Cream Popsicles. So, I decided that the frosting for this cake would use tea-infused butter to give it a more nuanced flavor and then I would decorate the cake with real berries as well since we’re deep into berry season. I had just ordered a tea from Townshend’s Tea Company called Forest Park that I knew would be perfect. The tea has blackberries, strawberries and raspberries — all Chris’s favorites. I found the process of making tea-infused frosting really wasn’t that much more complicated than making traditional homemade frosting. You melt the butter in a saucepan and let the tea sit in the melted butter for about 10 minutes absorbing its flavor. Then you simply strain out the tea using a fine mesh strainer or cheesecloth and let the butter cool in the fridge for a short period of time until it’s hardened. Once that process is complete, add your powdered sugar, vanilla and milk or cream and voila! Tea-infused frosting ready to be devoured. One thing to note is that this recipe includes more butter than you would normally need. Some butter will get lost in the process of melting or will remain on your tea after it has been strained. This recipe will frost 1 cake not including the sides of the cake. If you plan to frost the sides of the cake as well, I would recommend adjusting the ingredients to make 1.5 portions (multiply all ingredients by 1.5). 1. In a small saucepan, melt butter over medium low heat until fully melted. 2. Remove the butter from heat and add Townshends Forest Park tea. Let the tea steep in the butter for 8 minutes. 3. Meanwhile, find a large bowl that you plan to prepare the frosting in. Once the tea has finished steeping, strain the butter into a fine mesh strainer or through a cheesecloth, removing the tea. 4. Place the bowl in the refrigerator for 15-20 minutes to chill the butter. 5. Once the butter is chilled, remove the bowl from the refrigerator, add the vanilla and salt and beat the mixture for 5 to 8 minutes adding powdered sugar and cream a little at a time until the frosting is light and fluffy. 6. Add more powdered sugar for thicker frosting. Add more cream for thinner frosting. This cake recipe is fairly straightforward. It is important to know that the batter will be thinner than most cake batters. You haven’t made a mistake. Keep going. Also, do you hate that your cake layers never turn out flat? Do you always have to cut off half the cake or fill it in with frosting? Me too! Ugh. A couple years ago I found a great tip for fixing that issue. Just cut a towel into thin strips that can wrap around your cake pans, moisten the strips with water and secure them with safety pins before putting your cake in the oven. The moisture in the towels helps the cake on the edge of the pans bake more evenly which gives you a flatter top to your cake. Yippee! More details from A Cozy Kitchen if you want a step by step guide. Recipe modified from My Baking Addiction. 1. Preheat oven to 350. While oven is preheating, butter and flour two round 9” cake pans or a 13”x9” baking pan. 2. In a large bowl, mix together sugar, flour, cocoa powder, baking soda, baking powder and salt until combined. 3. Add the remaining ingredients to the dry mixture: eggs, buttermilk, water, vegetable oil and vanilla. Beat with an electric mixer for two minutes. Remember, the batter will be somewhat thin. 4. Pour the batter into your cake pans. 5. Bake for 30-35 minutes or until toothpick comes out clean. If using a 13”x9” pan, bake an additional 5 minutes. I found one of these gorgeous watercolor-esque espresso mugs with gold on my recent trip to Seattle. I was happy to find out they’re actually made close to home by redraven studio who recently moved to Oakland. I really love the one pair of satin pajamas I own. Since Victoria’s Secret is having their semi-annual sale I snatched these Afterhours Satin Boxer PJs. Hopefully they’re just as wonderful.